In this video, I reveal two of my favorite single leg TRX exercises. Using the anterior and lateral reach will challenge lower leg balance/stability while improving hip and thigh strength for any athletic pursuit. 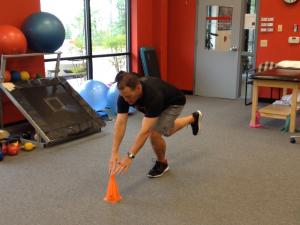 These progressions are excellent for ACL and other knee injury prevention and advanced rehab programs. Turn up the volume as the camera is far away to capture the video. Enjoy! This is the third exercise in my three part series on single leg training for improved running performance. The prior two exercises focused primarily on quad/hamstring/glute development. Today’s exercise addresses frontal plane hip control emphasizing the gluteus medius muscle as well as continuing to improve single leg stability. When doing this exercise, you will definitely feel the quads and glutes working to lower the body down, but to avoid the knee caving inward (a visible indication of excessiove femoral internal rotation and a weak gluteus medius) you must actively fire the gluteus medius to maintain proper alignment. I utilize this exericse a lot with runners and my female athletes to reduce with ACL injuries as well. The key thing to focus on here is keeping the knee in line and over the foot as you lower down. For beginners, it is perfectly fine to lightly touch the reaching toe or heel to the ground once you begin to lose balance or control of the movement. One pitfall to avoid is leaning the upper body away from the reaching leg to stay balanced. Note: those with lower arches and overpronation may find this more challenging as well. It is always better to move a shorter distance with proper execution than to compromise form and use other muscles to complete the movement. This exercise is particularly beneficial for runners struggling with anterior knee pain or IT band issues as well. It conditions the muscles to reduce lateral dispalcement of the kneecap, a common scenario which often increases shear forces in the knee. Perform 2-3 sets of 10 on each leg as part of your training program once or twice per week. As you advance, consider adding an unstable surface such as a pillow or soft pad (as demonstrated in the video below) to add difficulty. The unstable surface also helps strengthen the ankle and reduce sprains.